Have you had green beans almondine? Now try Broccoli Almondine. Almonds and nuts contain the heart-healthier monounsaturated and polyunsaturated fats. The American Heart Association recommends eating at least 4 servings per week of nuts, legumes or seeds. Preheat oven to 425 degrees. Spray a baking sheet with cooking spray. 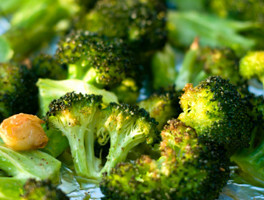 In a small bowl mix together broccoli, olive oil, garlic, almonds and black pepper. Pour mixture onto baking sheet. Bake for 10-12 minutes until broccoli tips are slightly brown. Pour broccoli into a bowl and mix in lemon juice and Parmesan cheese.